We added an 8-week-old weimaraner puppy to our family in 2016. It was helpful to have a crate for our puppy as well as a pet gate. Our senior dog Ace can be grumpy with puppies, so these products helped provide each dog with their own space when needed. If you’re thinking about adding a second dog to your family, gates and crates can help keep all your pets safe and happier. This is especially true during the initial transition period. This post is sponsored by Carlson Pet Products. 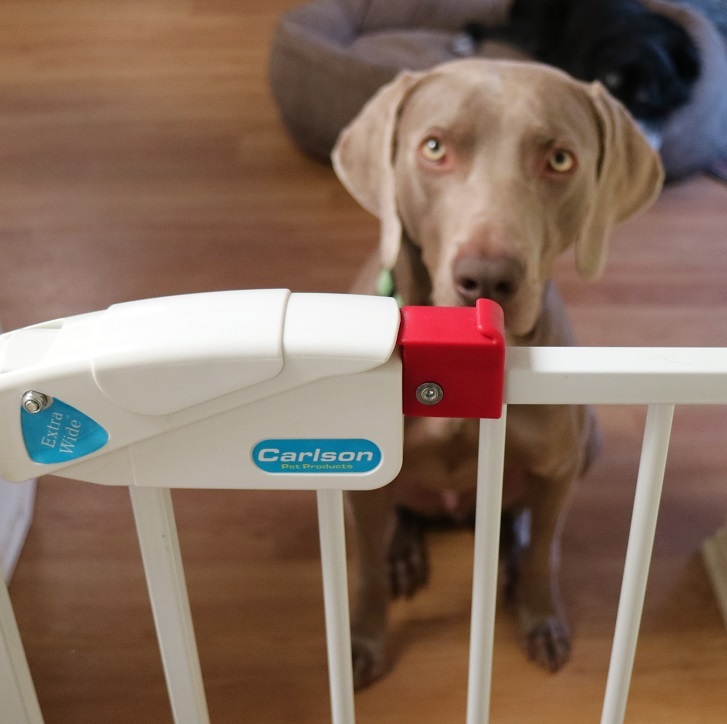 Carlson Pet Products is giving away a gate or crate (winner’s choice) to one reader of That Mutt. Leave a comment at the end of this post to enter. *The giveaway has ended. If you’re getting a second dog or a puppy, I’m sure you’ve thought about finding the right “match” for your current dog. However, even if both dogs are friendly in general, sometimes there’s still some grumbling and growling during that initial introduction process. For that reason, I recommend introducing the dogs outside in a neutral area if possible vs. in the entryway of your home. Your first dog is more likely to feel protective or territorial at home. I suggest taking the dogs on a walk together right away. Avoid head-on, nose-to-nose greetings at first. Start out side by side or one in front. Stay relaxed! Tension in your posture or in the leash makes the dogs tense too. Provide your first dog with plenty of exercise the day and morning before the new dog arrives. 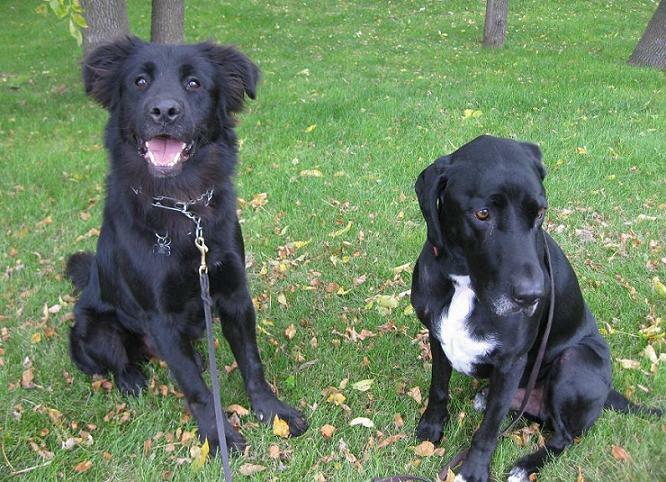 If all goes well, you might be able to allow the two dogs to sniff and play in the yard after their walk together. However, sometimes it’s helpful if you have a crate set up inside so you can give the new dog some quiet time to decompress. We have the large wire crate from Carlson Pet Products. Remy is modeling it below. It sets up in seconds and comes with a bottom pan that’s easy to remove and clean. View all of Carlson’s crates here. I like to volunteer as a foster home for dogs through a local rescue group. 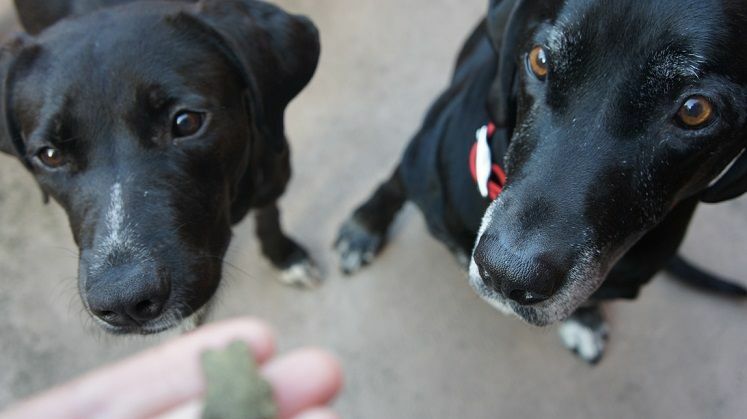 Fostering gives dogs time away from the shelter while they wait to be adopted. Often, I pick a new foster dog up directly from the shelter, and I find that most dogs need 24 hours to just rest and decompress after living in that kind of noisy environment. My typical routine with a new foster dog is to go for a long walk immediately. Ideally, with my own dogs along. Then, we give the foster dog some down time in her crate. I don’t always know if the foster dog will get along with my own dogs, so obviously we handle introductions slowly. Just because dogs get along outside on a walk doesn’t mean they’ll do well in the tight quarters of our apartment. For that reason, a gate is also helpful. The dogs can sniff and interact through the gate while we watch their body language to make sure everyone is comfortable. Note that gates and other barriers can actually bring out aggression in some dogs. This is why it’s best to do your initial greetings outside in a more open space. When we got our puppy Remy, we knew our older dog Ace was not going to tolerate being jumped on, nipped at or snuggled (grumpy old man). The good news is our two dogs snuggle up together today, but it took about a year to get to that point! During that difficult “puppy stage,” it was important to provide our senior dog and our cats opportunities to get away from the puppy. 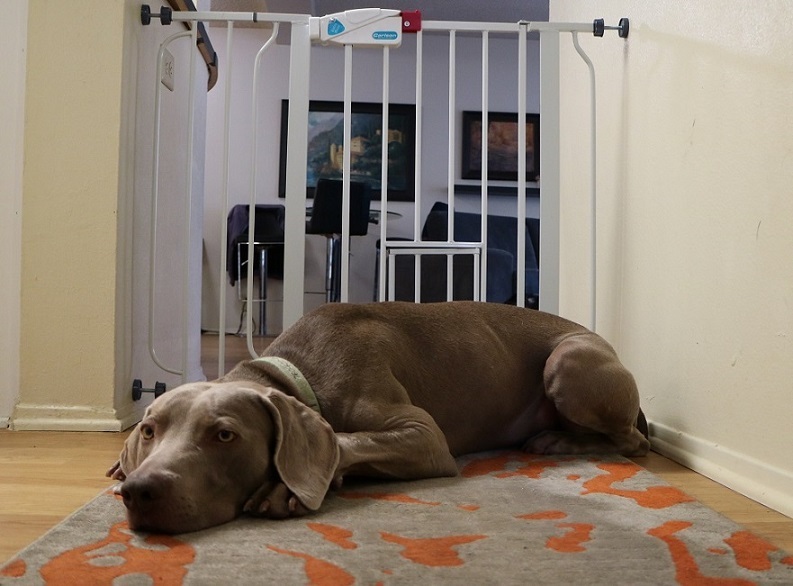 The easiest way to do that was using a pet gate in our hall. The gate was a boundary that kept our puppy in the main living room area of our apartment. If our senior dog wanted to come or go, we just opened it and let him pass. Our cats could easily hop over on their own, and it also has an adorable little cat door. Recently we upgraded to the gate with a lift handle. This is so handy because we don’t have to step over it every time we want to pass. Our “puppy” is now 2 years old, but we still keep the gate up. Usually it’s open so he can come and go like the others. But occasionally it’s still nice to keep the youngster to one area! You can view all of Carlson’s gates here. I like that Carlson’s gates are sturdy and made of steel. They are easy to set up using simple pressure mounts. Finally, we like having a pet gate for those rare times when our friends or family bring their dogs to our apartment. It’s just less stressful for everyone if we put our own dogs behind the gate when the visiting dogs arrive. The dogs can then sniff and greet through the gate for a few minutes before we let them run around loose together. Ideally, we should head out for a walk with all the dogs but this isn’t always necessary if the dogs already know each other. The gate is more about convenience and managing our dogs so they’re not barging through the door or jumping on everyone. Overall, I view these types of products as nice options to have on hand when you have a houseful of creatures like I do! To enter, just leave a comment below so we know you want IN on the drawing. 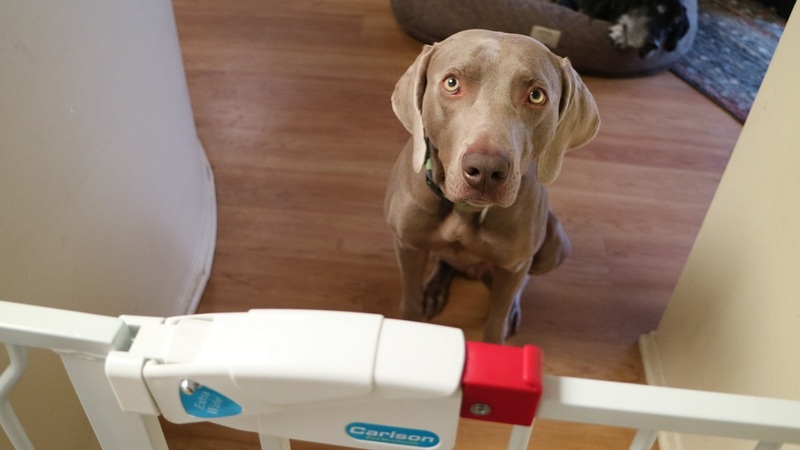 How could a new gate or crate help your dog? Must have a U.S. mailing address to win. I’ll choose a winner randomly on Tuesday March 27 and notify him or her by email. Then I’ll post the winner here too. 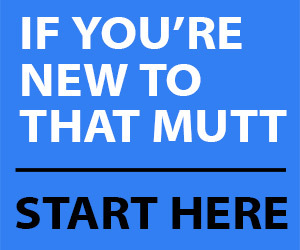 That Mutt’s $5/mo and $7/mo Patreon members receive automatic entries into all the blog’s giveaways, including this one. We still have a few spots left. Join us here and support the blog. Could your dog use a new gate or crate? Let us know in the comments, and please share this post if it will help a dog owner you know. Is it mean to crate a dog? I would love to win this product. Great article. I find a gate very useful to segregate dogs when feeding. Food guarding can result in unexpected aggression. Less stress and the safety of all is top priority . I love both using a gate and or a crate . I would love to win a gate for me to use in a door way. Great information! We use a gate every day at feeding time. When both dogs are finished eating, we open the gate and the first thing they do is run to the other’s bowl to see if they left anything. Lindsay, great article. My dog Tanner isn’t particularly fond of meeting new dogs, but he does well with walking other dogs together—I think the pack mentality takes over! Would love a gate to keep Tanner separated during initial visits from new dogs or excited young children or vulnerable adults. I would love another crate for our dog. He counter surfs when we’re away and has to be crated, but it’s a pain to take our large crate with us every time we go to my parents’. Sure would be nice to have to separate my toddler Grands from my two Frenchtons! Looks like very well made products. A gate would be great! BTW…love your tips and tricks! I have always used gates and crates to help keep things copacetic at home, but my current dog is a small one (a min pin). Now I am hating ready to add a silken Windhound to my family and would love to have a large crate! We have 3 of the Carlson gates and they are wonderful for new introductions, separation and sometimes our sanity. Crate is best for new pups while healing and potty training. Some show great prowess for interior decorating. Best about Carlson gates is that we can get through them to go from room to room. We are too old to climb over a gate that is tall enough to contain our pack. Also nice is ability to take gate down when it isn’t needed. 2 of ours have “cups” permanently mounted and 3rd is just friction mounted. Thanks for the opportunity! A crate would be nice for many reason; we petsit for friends and family and our dog can be nervous at times. We also hope to start fostering in the near future so this would come in handy! We are moving and I would LOVE to win a pet gate!!!! Would love to win the pet gate. My puppy is about 8 months old and would love to give him a little of mobility while he is home alone while I’m at work. The puppy gate would allow him some more independence but not allow him free range to the whole house and opportunity to chew on things when he knows we aren’t watching. Thank you for that great article! My son is thinking about adding a 2nd dog to their pack. Look forward to more information from you and will check out these items. We love the Carlson gate. We have 2 of the extra wide gate with lift handle. However, we have had 2 Springers figure out how to crawl thru the cat door at full grown, its funny! Haha! Would love to see that! 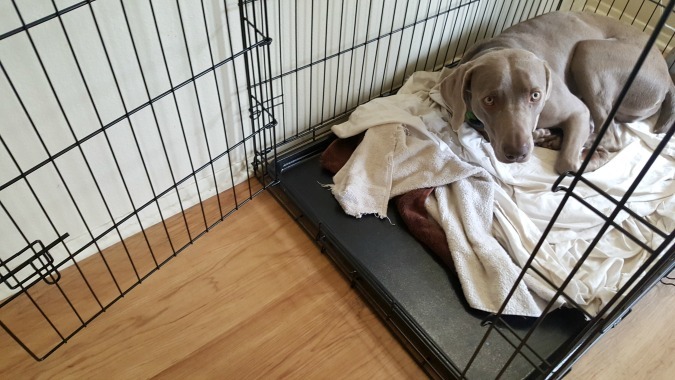 I have a rescue dog that is learning boundaries when in the house – we have mastered crate training but now working on impulse control and boundaries this would really help us out !! Love the blog! 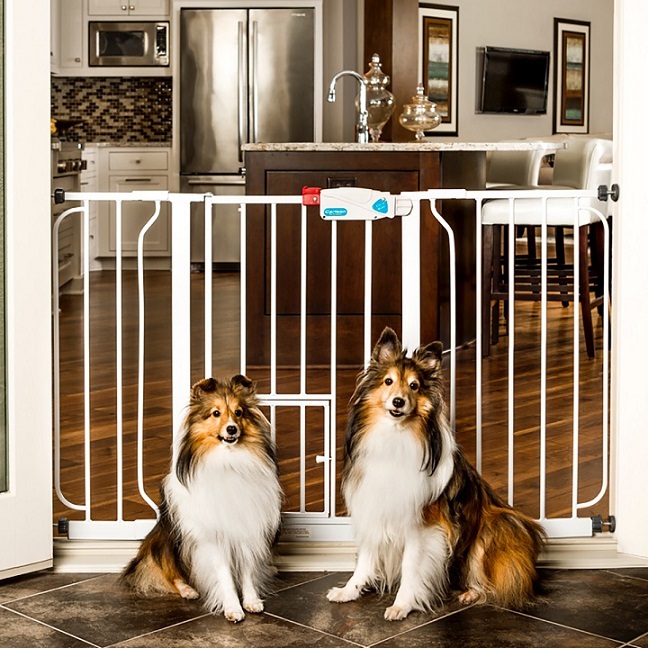 Would LOVE to try the pet gate! I have yet to find a good one that my Weim can’t go through or jump over. We use both a grate and gate. I would love to have another gate! We just took down our last gate because we were fed up with climbing over it, going up and down stairs! Our 18 mo puppy has become pretty consistent with staying in his boundaries. But we have him in the car with us all the time and I would LOVE a second crate so I don’t have to lug his in and out every day! My walls and door are taking a beating! We feel that we are all safer in the car if he travels in his crate (he rides in the back of our RAV4 but we usually have 1 or both back seats down so we can see each other. I would love to know how you and others travel with your dogs. Just ordered that for quick trips when we won’t leave him in the car at all. Thanks for the suggestion! And just because I mentioned it – we do occasionally leave him in the car while we run quick errands because we know he would rather be in his crate with us than in his crate at home alone. We are VERY sensitive to air temperature and circulation, and park in quiet spaces where he won’t be anxious. He is always sleeping when we return and very excited to see us – not at all stressed out! But this is NOT a good solution for all dogs. Awesome, I hear ya. I leave my pups in the car for short periods too. I appreciate your blog and have gleaned many tips from your articles and the comments. I have never used a create with any of my dogs, but our newest rescue is quite excitable and I have been intrigued about using a crate for her since reading some of your previous posts such as “is it mean to crate a dog.” Winning a crate from Carlson Pet Products would give me a chance to try it. I’d love to have a crate OR gate! Thanks for the article! I am happy to see crating in a positive light. I currently have 4 dogs, one of them a foster dog. They all view their crates as a safe and comfy place to rest, not a punishment. A gate would come in handy to keep them contained from dining room when we have guests. I’ve been a devoted user of crates and gates with my two Lab mixes and each of the fosters I’ve welcomed into my home. Whenever a service person is visiting my home, my dogs retire to their crates and are welcome to do all the sniffing and talking they want while the person completes their task in the house. The dogs each know they have their own house to which they can retire in comfort whenever they want. have it now closed off by my ironing board. i keep a crate open in the living room, now, i feed my youngest in the crate so the older girl cant get to her food. i keep a few crates in the house in case of emergencies as well. I have 2 small old dogs, a kitten and a 1 yr old female Doberman. Without gates and crates I would not survive! My Doberman loves to tease the small dogs so if I go out I have to separate them. My small dogs chase my kitten so again the gates help give him a fighting chance. I gave now just lost my husband who had our 6. Yr old doberman so now I have 4 dogs and 1 kitten and desperately need a crate to provide some sanity. My female is fixed her dad the 6 yr old make is not so I dont need to detail the new issues I am dealing with . Help! We could use one of these nice crates for our expanding family of fur buddies. Thank you for continued informational articles that are relevant to me as a responsible pet owner. I have been tripping over my existing low gate so many times which caused me so many health issues, knees problem and wrists problem. The gate would definitely help reducing the chance of me tripping over and separate my rescuses cats and my puppy. My dog already has a crate, but I am in need of a new pet gate. My current one is so old that it is almost to the point of non-use. The open/close part is freezing up an me so that I can neither open or close it without great deal of problems. I am a Foster Mom for a local rescue who has five rescue dogs of my own as well as cats and birds. I have dog crates from the rescue but would love to have a good gate to help keep areas separate for the Foster dog and my own pack. My fur baby OSO & I would be so happy to win the gate for our front door! Then, we could keep it open & get some cool fresh air in the soon-to-come hotter weather! 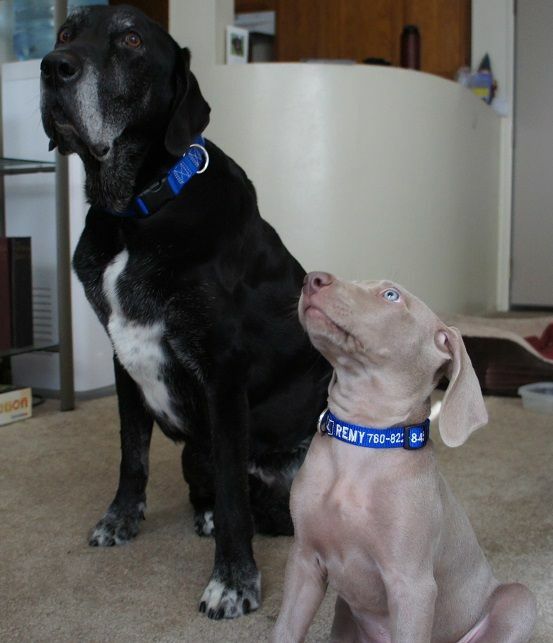 We need this for our two pups!. So they can enjoy being out on the back deck with us and not need to be leashed!. I am definitely in need of a gate as we are getting ready to transition out of the crate during the day!!! We have been looking into a gate so our dogs can have a whole room to themselves when we are out making cookie money, instead of being crated. Awww, that picture of puppy Remy….just adorable!! I would love to win this product. I currently use a baby gate and over the years, Stella and Blue have really put a hurting on it. Great article. I hope I win! We use a gate to separate the 2 dogs from the 4 cats and it works wonderfully. the one we have doesn’t have a walk thru door so we have to step over it. but oh i would love one of these you show. 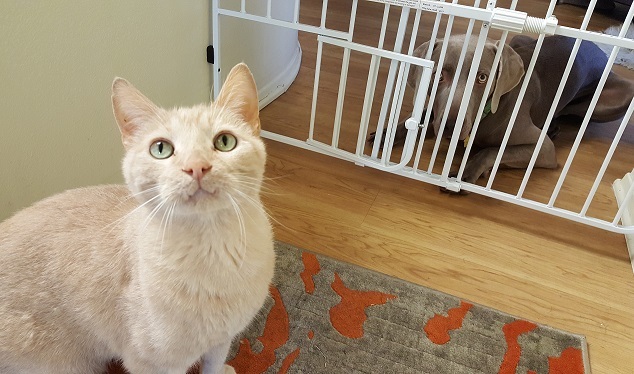 gates are great because they let the dogs socialize and still keep the kitties safe. Gates are an absolute saving grace with our new puppy. I would love another one! I would love to win this product. I love to use gates to keep puppies and senior dogs safe.